In honor of Bladder Health Month this week’s blog is dedicated to Interstitial Cystitis/ Painful Bladder Syndrome. 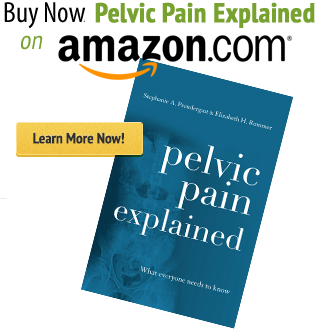 IC/PBS is a treatable pelvic pain syndrome affecting roughly 3 million men and 9 million women in the United States alone. In order to successfully beat IC/PBS it’s helpful to take a look at history and understand what IC/PBS is and is not. Interstitial Cystitis was first described in the 1800s as an inflammatory disease of the bladder. In the early 1900s, Dr. Guy Hunner identified via cystoscope that some people with IC had lesions in their bladder lining and subsequently the term ‘Hunner’s Ulcers’ was coined. Other physicians warned Dr. Hunner about the visual limitations of the cystoscope and that these limitations could lead him to erroneously believe he was seeing true ulcers. Despite other medical opinions, Dr. Hunner’s belief that IC was defined by ulcers remained the diagnostic gold standard for the majority of the twentieth century. In 1978, Stanford researchers Messing and Stamey published a study stating the majority of patients with IC do NOT have Hunner’s Ulcers, marking the beginning of a number of conflicting studies about the relationship between Hunner’s ulcers and IC. For the next 30 years there was significant debate over Interstitial Cystitis nomenclature, pathophysiology, and diagnosis and treatment. Without a standard of care, clinicians, researchers, and patients struggled with how to identify IC and how to treat it. Fast forward to 2011 when the American Urologic Association published the first diagnostic and treatment guidelines on IC/PBS, and then revised and improved the guidelines in 2014. After over 100 years of confusion, we now have guidelines that set the gold standard for today’s clinical practice! We should be thrilled! We are not. Why? These guidelines have not yet made their way into every medical practice in the United States and we need to make that happen. A recent video from the Interstitial Cystitis Association describes one woman’s frustrating diagnostic journey, showing the need for more awareness about the syndrome. The AUA guidelines offer successful treatment options that need to be made available to all people diagnosed with IC/PBS. The basic assessment should include a careful history, physical examination, and laboratory examination to rule in symptoms that characterize IC/BPS and rule out other confusable disorders. Cystoscopy and/or urodynamics should be considered as an aid to diagnosis only for complex presentations; these tests are not necessary for making the diagnosis in uncomplicated presentations. Guideline #3 is important because for the first time, experts were no longer suggesting that a cystoscopy is necessary to diagnose IC. This is great news for patients because undergoing a cystoscopy is no picnic. Research shows that people with IC/PBS symptoms do not always have Hunner’s Ulcers and asymptomatic people may, in fact, present with Hunner’s ulcers. Turns out, doctors were correct to warn Dr. Hunner 100 years ago that cystoscopy may lead to false IC diagnoses. People with Hunner’s Ulcer IC/PBS do make up a small subset of the number of overall people with IC/PBS, just not as large of a number as once thought, and people without lesions can have IC. So for people with IC/PBS without lesions, if the bladder isn’t the problem, what is? Interstitial Cystitis specialist and urologist Dr. Ken Peters covered the latest information on IC/PBS at the 3rd World Congress on Abdominal and Pelvic Pain this past October. He presented IC/PBS is a multifactorial pain syndrome that can involve the bladder, the pelvic floor and musculoskeletal system, and the central and peripheral nervous systems. Dr. Peter’s entire lecture is available (starting on page 108), here. What does this information mean for patients and for treatment? The AUA Interstitial Cystitis expert team conducted an expansive literature review and chose treatments based on quality of the evidence supporting their success and safety. When a person is first diagnosed, the first-line treatments offer general strategies to help manage pain and improve comfort as a person’s treatment team and plan is being formed. Physicians, pelvic floor physical therapists, and psychologists can all play a role in first-line treatments. Lorimer Moseley and David Butler’s work has shown efficacy in reducing pain and suffering time and time again through pain physiology education alone. These desensitization and pain education strategies are being widely used by physical therapists today. It is crucial for people to learn the difference between persistent and acute pain and to learn about the plasticity of the nervous system to change from a sensitized state back to a pain-free one. So how do we get there? We now know that IC/PBS can be associated with bladder inflammation but often, the bladder is the victim, not the cause. This is one reason why the first-line treatments are seemingly more general instead of bladder-directed treatments. They are first-line treatments because pain is pain and these strategies help all pain, including people with IC/PBS. We know that 87% of people diagnosed with IC/PBS have pelvic floor muscle hypertonus. We also know a high percentage of people with IC/PBS have peripheral and central nervous system hypersensitivities. We know that hormonal factors can cause tissue changes that can result in what feels like bladder pain. A recent article featuring urologist Dr. Rachel Rubin, titled “Think beyond the bladder for Interstitial Cystitis pain” covers these concepts and the latest research on these topics in more detail. The bottom line: there are different subsets and underlying causes of IC and effective treatment plans will address these issues in an individualized plan.The AUA second-line treatments get into the details. The AUA second-line treatments are more specific to the different subsets of patients with IC. The guidelines clearly state the pelvic floor physical therapy should be offered to patients when pelvic floor dysfunction is present. Most patients with IC/PBS will benefit from pelvic floor physical therapy, for example, but if the person in question happens to be in the minority of the IC/PBS population without pelvic floor dysfunction they may not benefit from PT. When nervous system hypersensitivity is a factor manual physical therapy may not be appropriate until the pain is better controlled. Pain science education and self-care may be a better choice, two other things physical therapists can help with. In addition to education, oral medications may be useful to decrease nervous system hypersensitivity, however, they may not be tolerated so they may not make sense for one patient but they could be very useful for another. The medications may need to be adjusted multiple times before they help, patience is key. Patients with bladder pain may not have bladder lining inflammation, but if they do, intravesical treatments may be helpful for them. Interdisciplinary management and communication is key to help people formulate the treatment plan that will work for them from the second-line treatment options. The AUA guidelines go on to list third – sixth line treatments. These may not be recommended for all patients and can be viewed in the official guideline link above. There is no one-size-fits-all treatment protocol for IC/PBS. Multimodal combinations of therapies are effective and can result in complete symptoms resolution! We understand that getting a diagnosis can be challenging and navigating the number of treatment options is overwhelming. Pelvic floor physical therapists are well-positioned to help patients organize their medical team and help patients make reasonable, strategic treatment decisions. They can provide patient education, pain science education, manual clinical treatments, and home exercise programs. Pelvic floor physical therapists are afforded more time with patients than their medical colleagues and must know the ‘ins and outs’ of physical therapy. Many people may not realize that physical therapists also must understand what pain management can offer, how the urologist can help, if they need to see their gynecologist again, if they need to be tested for things like SIBO or other GI disorders that can stem from repetitive antibiotic use, etc. Physical therapists need to know what they can treat, what they cannot, and when to refer the patient back to the doctor or to an additional physician to help with the overall picture. Pelvic floor physical therapy is listed by the AUA for a reason, and we strive to raise awareness and show the medical community and suffering patients how we can help. People with IC can help raise awareness by sharing blogs, the AUA guidelines, lectures from the World Congress, or one of our resources below with other suffers or the unknowing medical providers. The AUA guidelines are evidence-based, reputable, and many urologists don’t even know they exist! Each year diagnosis and treatment options improve, however, we need to keep working to shorten the time it takes for people to receive a diagnosis and the time it takes to restore pain-free living. Below is a list of our favorite treatment-based resources, we hope you find them helpful in your recovery. 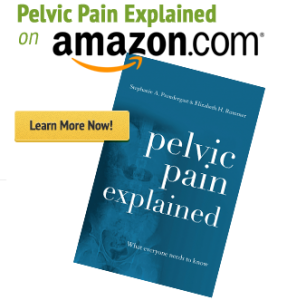 Our book, Pelvic Pain Explained is a resource manual that helps readers understand how pelvic pain develops, it helps navigate in-clinic and at-home treatment options for men and women. Physical therapist Nicole Cozean authored the Interstitial Cystitis Solution, a fantastic resource with a more in-depth look at IC/PBS and the different treatment options available. For a faster read, PHRC published a blog about the specifics of physical therapy treatment for IC/PBS. Our website contains more detailed information about the physical therapy evaluation and treatment for IC/PBS. The Interstitial Cystitis Association and the Interstitial Cystitis Network are two patient advocacy groups working hard to raise awareness about IC/PBS and help patients through the diagnosis and treatment process. People can find pelvic floor physical therapists through the American Physical Therapy Association’s Section on Women’s Health and the International Pelvic Pain Society and the Pelvic Guru website. A very nice explanation of I C.
This post should be required for all health care workers. Thanks, Stephanie! I will share this resource with my patients who come in with the prior assumptions you mentioned. You have provided a fabulous outline of current best treatment approaches.